Weddings are always characterized with heavy decorations, arrival of relatives from every corner of the country, chattering of friends and plenty of pomp and show. Most of the functions start many days before the scheduled wedding day. The bridegroom and the bride in their respective houses take part in lots of rituals and garner the blessings of elders. On many occasions, the families visit each other with gifts, which include sari, ornaments and so on. Although both bride and groom stay busy in these ceremonies, the bride is expected to attract most eyeballs. People, who visit her home, wish to see and congratulate her. Hence, she is required to look her best and feel awesome in every ritual. Apart from jewelry, her bridal saree should be perfect. It should be something that would make her look absolutely gorgeous and people should be awestruck by her appearance. What makes the bridal saree so special? 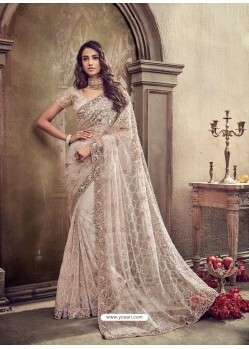 Bridal saree is a breathtaking garment. It is considered the most ornamented woman’s outfit. The work on the fabric is done with the sole aim of making the saree look class apart. No matter what your budget is, you will never find a simple looking bridal saree. As tradition says it should be special, the outfit available within every budget has fabulous features that are spread out on the entire fabric. In short, every bride looks extra special on her wedding day and experiences the meaning of being the center of attraction. At YOSARI, we believe in traditions and understand how a wedding outfit should grab everyone’s attention. That is why no matter what your budget is, you are guaranteed to find an elegant bridal saree for yourself. Conventional outfits are available in the color of deep red. The typical color not only blends with the Indian skin color but also has a religious significance. In Hinduism, the red shade is indicative of fecundity and opulence. By wearing the saree in red, the bride brings these two blessings into the life of the bridegroom and his family. With time, other colors began to be added along with the red in order to make the dress look even more special. Orange, crimson, maroon, pink, golden, silver are the most important colors that you will find in bridal sarees. Current fashion has encouraged even more colors to be included like teal, blue, white, green, cream etc. These colors enhance the look of the bride to a great extent. In fact, when the bride stands against the backdrop of glamorous wedding decorations, these hues create a nice profile of hers. As for the blouse, wedding attire comes with blouses, which are of same color as the tradition dictates. In case, you wish to experiment, you could go for a different colored blouse, which would be complementing the color of the saree. YOSARI values tradition as well as modernity. We have stacked our website with traditional bridal sarees as well as the ones that rank high on fashion meter. Browse through out collection and make your selection right away. What fabrics, work and embellishments are used in them? The options are just limitless giving most brides a time of confusion. However, every bride enjoys the search, as it allows her to drape herself in just the way she imagines herself to be dressed on the most important day of her life. Opt for designer sarees and you will find fabrics ranging from silk, satin, net, georgette, to velvet. These fabrics give the bride a breathtaking appearance because they are naturally highly appealing. Moreover, you would notice that the fabrics are embellished with a host of materials like thread work mainly done by resham, silver thread and satin thread, kundan work, borders made of brocade or net, zari work, stone work, patch work and so on. Usually, embellishments in contrast colors are preferred, as they shine under the light and make the garment shimmery. Nevertheless, you will also find sarees with same colored embellishments. YOSARI has a varied range of wedding garments with every kind of adornments. As per your preference, wedding setting, time of the day and makeup, you could choose a dress with the amount of decoration you would like on it. Why choosing YOSARI is a good decision for purchasing Bridal sarees? YOSARI is an all-in-one online destination for a variety of sarees for the bride. Whether you wish to wear traditional dress or prefer to experiment with the current fashion trend, YOSARI is the online shop which you should access. Not only saris, we pride ourselves in custom blouse stitching as well, which is carried out by our trained tailors. Our plenty of fashionable blouse designs will surely suit your taste and make you look many times more gorgeous. Here, you will enjoy the ease of selecting garments at your own pace. With wedding shopping being so hectic, online shopping at YOSARI is the best way of choosing the perfect bridal attire. Moreover, our shipping is fast and trustworthy. Place your order and be assured that the outfit would reach your doorstep for sure. Our selection of garments is huge and boasts several varieties. Furthermore, our prices are genuinely low and meet the budget of most brides. Even better is the 14-day replacement option. According to it, in case you find that the garment is not up to your liking, you could return it to us and get your money back. It does not matter where you are located. Our shipping of items is not restricted to India only. We successfully cater to the demands of our international clients by shipping items to Canada, Australia, USA, and the UK. BUY NOW!